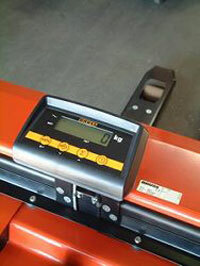 The EGW – B weighing system can be installed on any brand of electrical pallet truck. The weighing system has a high accuracy and is available in legal for trade version. The construction consists of two parts. 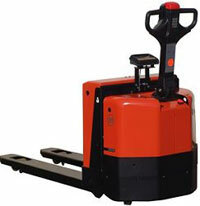 The forks of the electrical pallet truck are modified and fitted out with four or six load cells of 1000 kg. A pair of fork shoes are fixed rigidly onto the load cells. This construction without moving parts guarantees a very robust build of the weighing system. The weight indicator and any peripheral equipment are mounted in such a way as to achieve optimal visibility without obstructing a proper operation of the truck.